The word mandala comes from the ancient Sanskrit word meaning center or circle, which is exactly what a mandala is. Mandalas are circular patterns with a single focal point in the center. They are often used in meditation to bring about higher levels of consciousness or to bring about physical and psychological healing. Mandalas may contain a wide variety of symbols to promote spiritual growth and healing, but in the case of the sun mandala, the sun is the focal point. Where Do You Find Sun Mandalas? Sun mandalas have been depicted by people world wide since ancient times and can even be found in cave paintings or carved into ancient ruins. They have been part of religious and ceremonial events, have been used in artwork, are found in storybooks, on new age websites and emblazoned on gifts and clothing items in new age or pagan shops. They can also be found in tattoo designs. 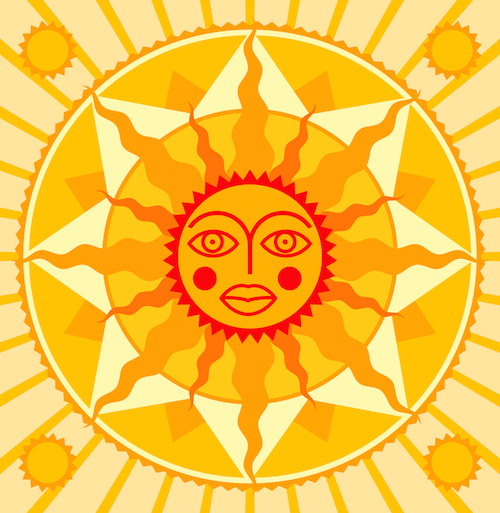 The most common place to find sun mandalas are in children’s or adult’s coloring pages or as images to use for meditation. What Do Sun Mandalas Look Like? Radiant Heat Sun Yantra: This sun mandala features a large sun with wavy rays radiating outward. It typically consists of red, orange and yellow. 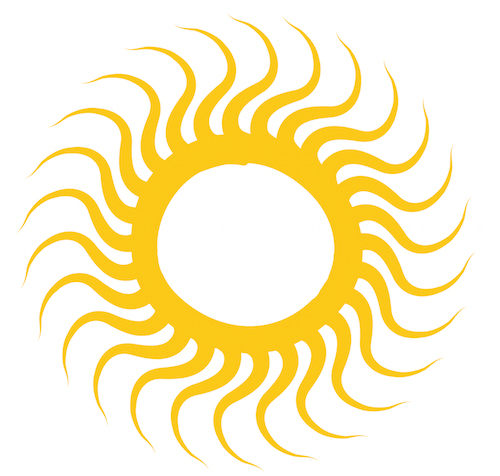 It contains several concentric circles to represent the center of the sun, but does not contain an outer circle. Focusing on this mandala (called a yantra because it combines the concepts of mandala and mantra) is thought to bring energy into your life and relieve exhaustion or feeling run down. Vitality Sun Yantra: This sun mandala is similar to the Radiant Heat Sun Yantra, but its design is more geometric and it features an outer circle. This sun mandala is designed to promote recognition of your own inner energy. Creative Energy Sun: This sun mandala has wavy rays that end in curls or spirals to form the outer ring. The center features several concentric circles for the center of the sun. It is typically done in red, orange, yellow and green. This mandala is thought to promote creativity. Love Sun Yantra: This sun mandala’s center resembles a floral design with flower petals of red or dark orange and yellow. As it progresses to the outer ring, the shape of the sun’s ray become more geometric and end with bright points of light radiating outward. It also contains green or black within the design. The love sun yantra is thought to promote self-love and teach you how to transform your life by starting with self-love. How Do You Use Sun Mandalas? Sun mandalas are often used as decorative art to brighten a room or give it a spiritual touch. They are also used in coloring books to inspire creativity and encourage children to explore the use of color in complex designs. But there is a higher purpose for the sun mandala. Using the mandala to focus your energy during meditation is thought to promote physical healing and spiritual growth. Because the mandala focuses your energy to a central point, it is thought to enhance and intensify the benefits of meditation. Some claim that the simple act of coloring mandala designs also promotes relaxation, spiritual growth and healing.